What is Sedation Dentistry? Is Sedation at Dentist Safe? Is Sedation Dentistry Safe? What are the Sedation Dentistry Complications? Sleep and sedation dentistry are generally safe but dental sedatives are not without their Risks and potential complications. The most important thing is to have have sedation dentistry performed by a qualified and certified dental anesthesiologist and not just any dentist with a prescription pad. Not all sedation dentistry reviews are positive. A dentist who holds a dental anesthesiology certificate. This is a dentist who has had training in hospital based anesthesiology residency. The training involves IV sedation training and emergency training in the event of a sedation complication. A regular dentist who is authorized to write prescriptions for oral sedatives such as valium and triazolam and whose training was mostly what was taught in dental school. How to find a qualified Sedation Dentist? Easy. Ask the dentist to see their sedation certificate which certifies them to provide sedation in your state. One easy way to know is to ask if the dentist offers “IV sedation dentistry.” Full IV sedation requires the most advanced training for the sedation dentist. The sleep dentist who is trained in IV sedation, will also offer other sedation options such as oral sedation and laughing gas / nitrous oxide sedation. The last thing you want is to have a sleep dentistry problem or emergency at your sedation appointment. And if you do have a sedation dentistry complication, you want some who has the highest level of training to deal with your sedative drug complication. Most dental sleep sedation problems are associated with emergencies related to dentists who do not know what to do in the event of a sedation complication. Sedation Dentistry Complications and Problems? Unpredictable oral sedation. The patient shows up and per the dentists instructions has taken 1-2 pills and they are not sedated enough to do the procedure. The dentist then has them take an additional pill and maybe even do some sedative gas as well. Before you know it the patient is over sedated and stops breathing. Drug interactions. A very detailed medical history should be taken including a list of the drugs the patient takes on a daily basis. Often times, drug interaction complications can be overlooked. A properly trained sedative dentist has specific training in all the common drug interactions associated with sedation dentistry. The devil is always in the details as they say. Under sedation with oral sedatives and nitrous oxide. sleep dentistry cannot always be safely and predictively achieved with oral sedatives and gas. Intravenous drugs can be administered quickly and adjustments can be made up or down to the desired level of sedation (since there is an IV in place). IV drugs are also stronger in addition to being more safe. In the event of a complication, most IV sedative drugs can be reversed to bring the patient back. Patient with high dental anxiety, long procedures, difficulty getting numb and gag reflexes should be sedated with a full IV sedation technique. 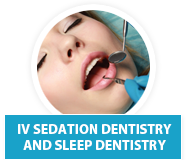 If performed by a qualified sedation dentist, sleep dentistry is not only safe but safer than without sedation. For example, if someone has a weak heart and they experience a high anxiety dental appointment, there can be a greater chance of a cardiac emergency. Additionally if a nervous patient moves at the wrong time, he/she can be cut or hurt by a dental instrument. Sedation can be necessary for all on 4 implants. Patients who remain calm and comfortable during their dental appointment, also experience less pain and swelling after their procedures. They may even experience better outcomes where healing is of great importance as in for example sedation for dental implants.